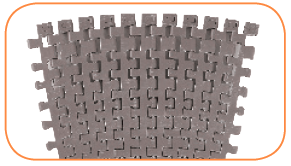 Please refer to 3200 Series Engineering Manual, pages 51-53 for details on modular belts. 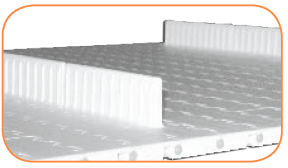 Available for incline applications. 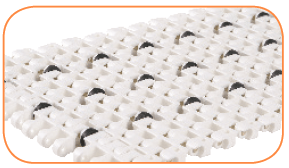 Inserts may be placed along entire length of the belt or spaced on 2″, 4″, 6″ or 12″ centers. 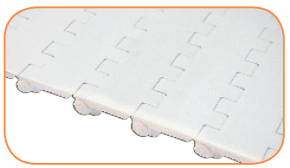 Friction inserts are indented 2″ (51 mm) from each belt edge. Provide a very closed surface for complete product support, easy wiping. 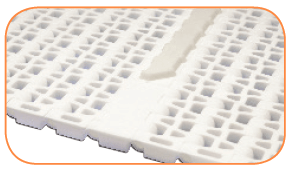 Provide an open surface for better drainage, cleaning, or air flow / cooling. Provide a tight turn radius, space saving corner. Side tabs ensure positive belt tracking with a flush top design. Reduces number of drives. Provide a sturdy cleat for elevation at steep inclines. Cleats are available in 1″ and 3″ heights. 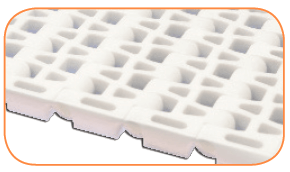 Provides low back pressure for accumulation of heavy load.